I ordered the Ann Taylor Boulevard Trench about a month ago because I fell in love with it at first sight. Not that I need another jacket but you can never have enough coats and jackets (especially when live in a colder state). When the jacket first arrived, I wasn’t sure about it. Even though, the sleeve length and the body length fit me quite well, it was just boxy all around. I asked my husband “what do you think about this jacket?”. His response was “ I love it”. That took me by surprise because he doesn’t say that very often about my clothes. He suggested “why don’t you bring it to your tailor and see what she can do?”. I have never had a jacket altered before so I wasn’t sure what to expect. I was thinking if it costs too much money, I am just going to return it. My tailor was so kind and she only charged me $30 for her work. I won't go into too much detail about this trench because small sizes are already sold out online (it is an online exclusive). I was so anxious to see the end result. A week later, I picked up my jacket and couldn’t be happier. 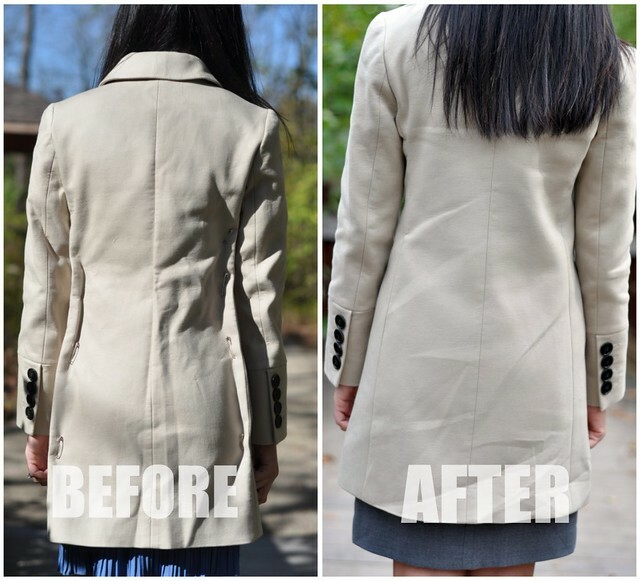 She gave the jacket a bit more shape by slimming down the entire back of the jacket. Hi! a trench is always a cool piece and you have found the perfect touch with this blue skirt! I have just discovered your blog and I have to say that I really love it! You have a wonderful sense of fashion and style...so, I follow you to keep in touch! Your tailor did a good job. Looks so much better. Awww the hubby is so cute. ooh i really like what you wore underneath. and $30 isn't bad for a trench alteration. p.s. i'm visiting columbus december 4th and 5th :) yes, you can never have too many coats in that state lol. I love it! I may have to look into that. It is very hard for me to find coats that doesn't swallow me up. Lol. Anyway, have you ever tried J Crew pea coat? I've always been hesitant to alter a jacket. I think I'll give it a chance now! Love your outfit by the way! I love the outfit Sydney! And the trench post alterations- perfect! Ohhh! This is one of my favorite looks on you! The image of you with your sunglasses while holding your scarf reminds me of Cee!! Love that scarf so much! It looks great...and I love the skirt! I can't believe what a difference the tailing made!! Such a great coat!! Can I just say how much I love your scarf peeking out from underneath the jacket?! The colors go beautifully together. Very Burberry-esque. Your taylor did great! Love your taupe blousy too! Lovely trench and vibrant skirt you have here. Thank you for your kind words about my family. wow, the trench looks incredible on you and i can't believe alterations were only $30! Glad that the alterations went well and were inexpensive! It looks great on you and I'm also loving your cobalt mini - beautiful! Loving this ensemble! Love the colourblocking with a more vibrant colour and a neutral. The alterations really made a difference afterward. And $30 is a real bargain for getting a jacket altered. It looks great on you Sydney!